Coulter Department Chair Susan Margulies (center) is flanked by Georgia Tech President Bud Peterson and Emory University President Claire Sterk. 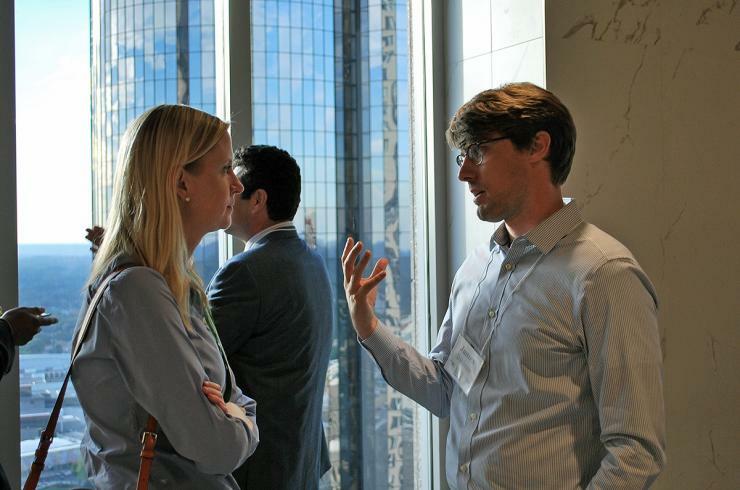 The Wallace H. Coulter Department of Biomedical Engineering (BME) at Georgia Tech and Emory celebrated its 20th anniversary with style, fortuitous timing, and a great view, last month at the Metro Atlanta Chamber of Commerce, which is on the 34th floor of 191 Peachtree Tower. 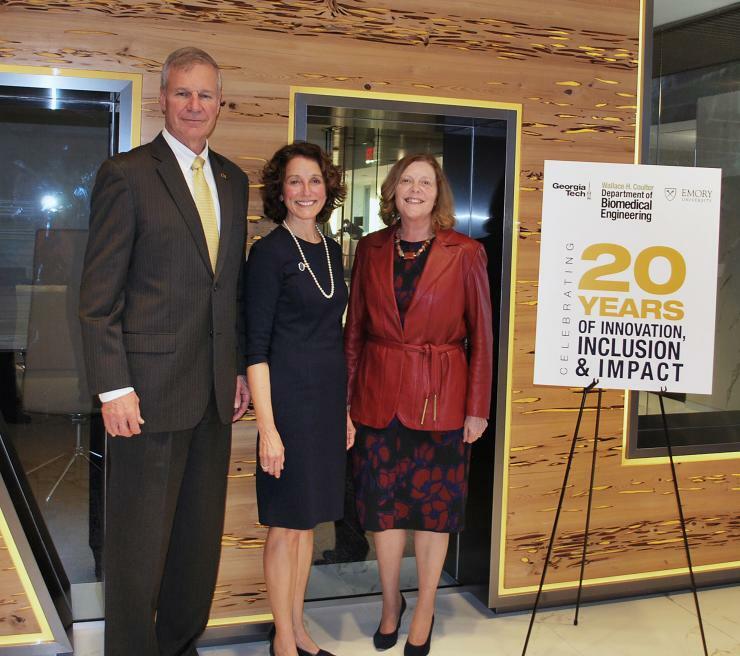 Two university presidents joined the Coulter community in the iconic two-headed Atlanta skyscraper to honor the unique biomedical engineering department, the largest in the country, shared by public and private institutions, and ranked among the best in the world. Though the department was actually approved in 1997, plans were finalized in 1998, in preparation for the first group of students in 2000. Explaining the birthday discrepancy, Coulter Department Chair Susan Margulies, who presided over Thursday night’s event, enchanted the room with a story about her grandmother. Margulies also introduced the gathering to the two presidents in the room – Claire Sterk of Emory University and Georgia Tech’s Bud Peterson. Throughout the evening, Coulter Department well-wishers – faculty, staff, alumni, and so forth – popped in and out to catch up, enjoy the view, tell stories. Many of them were going back and forth from BMES2018 at the World Congress Center. 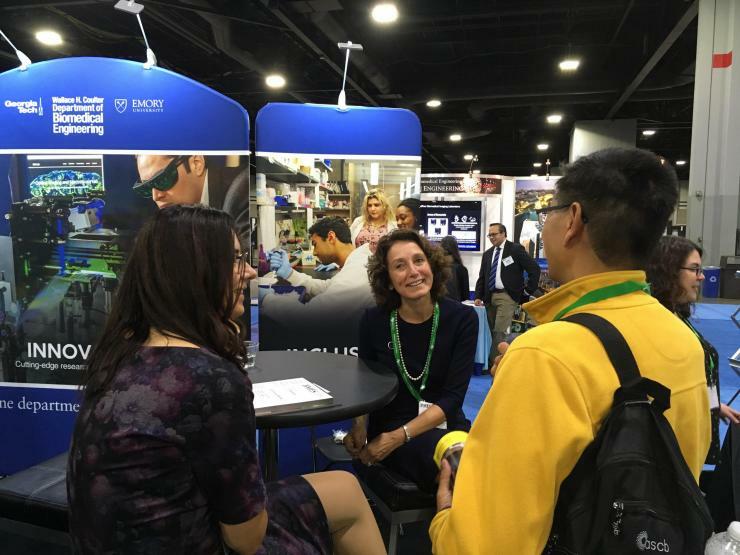 This was a record meeting for BMES, and the Coulter Department, the diamond sponsor, had a booth at a busy intersection of the convention floor. This year’s event drew record numbers of abstracts (3,672), exhibitors (143), in addition to 963 oral presentations and 2,265 research posters. The BMES meeting will not be forgotten by anytime soon by Manu Platt, a Coulter Department associate professor and Petit Institute researcher. 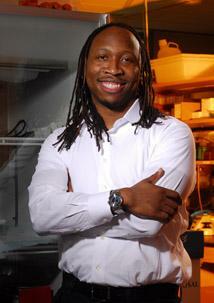 His lab saw to that, throwing him a surprise party for his 10-year anniversary. “They will remember this forever,” said Platt, who also counted Paula Hammond's honest and inspirational speech at the Celebration of Minorities in BME luncheon as a highlight of the BMES meeting. Hammond, a professor at the Massachusetts Institute of Technology, spoke frankly about finding strength through adversity and navigating difficult situations. A few blocks away, at the Coulter Department birthday party, Margulies praised the work of students, faculty, and staff, giving special recognition to the department’s three previous chairs – Don Giddens, Larry McIntire, and Ravi Bellamkonda, who all served during critical moments in the department’s evolution, but could not be present. Susan Thomas and James Dahlman talk shop during the BMES 20 Celebration. Coulter Department Chair Susan Margulies promotes the BME program during BMES at the World Congress Center. 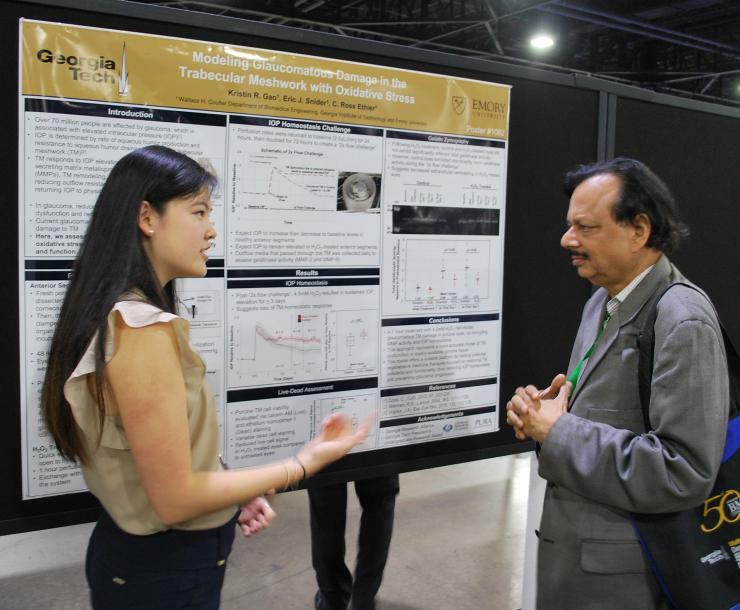 BME student Kristin Gao discusses her research poster with Balakrishna Pai, director of instructional iaboratories for the Coulter Department.